Located in a quiet neighbourhood in Udaipur, Chandra Niwas provides simple rooms with private bathrooms. It is about 6 km from Udaipur city and features laundry services and free Wi-Fi in public areas. 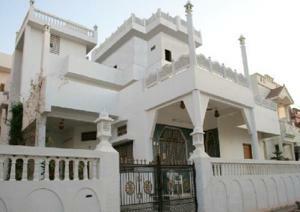 The bed and breakfast is situated about 7 km from Udaipur Railway Station and 28 km from Udaipur Airport. It provides ticketing services, as well as, car and bicycle rental facilities for guests’ convenience. Featuring a fan or air conditioning, the rooms all come with a work desk, a safe and a wardrobe. Some rooms at The Chandra Niwas have cable TV, a seating area and views of the mountain. Free! One child under 5 years stays free of charge when using existing beds. One further older child or adult is charged INR 350 per night and person in an extra bed. Maximum capacity of extra beds in a room is 1. There is no capacity for cots in the room. Any type of extra bed or child's cot/crib is upon request and needs to be confirmed by the hotel. Supplements will not be calculated automatically in the total costs and have to be paid separately in the hotel. American Express, Visa, Euro/Mastercard, Discover The hotel reserves the right to pre-authorise credit cards prior to arrival.